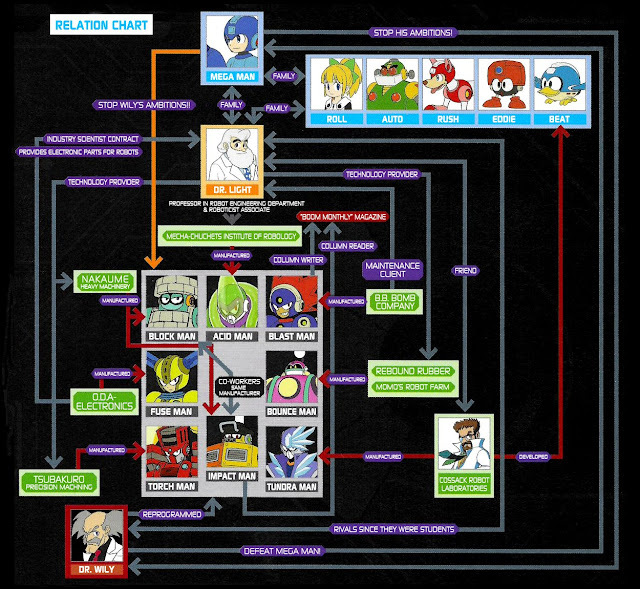 By way of Skycompass, here's a scanlation of the official Mega Man 11 character relation chart from the Rockman 11 Production Note. There's some fun little details going on here, like Impact Man is a regular reader of Blast Man's "Boom Boom Monthly" magazine column. Also, just in case the game itself didn't make it apparent enough, yes; Cossack Robot Laboratories did indeed produce Tundra Man. Several other scans from the Production Note have started to appear online, too. You might want to follow Rock Miyabi and see what's up. Love that dr Cossack made the greatest robot master ever. Only the brilliant genius of Dr. Cossack could create someone as fabulous as Tundra Man. Even his explosion is beautiful! Omg Dr. Cossack made Beat? and Tundra Man? It's practically treason that they forgot about Reggae. When will the bird come back? When will the cat come back? Stay tuned for Mega Man 12 The Final Hour.